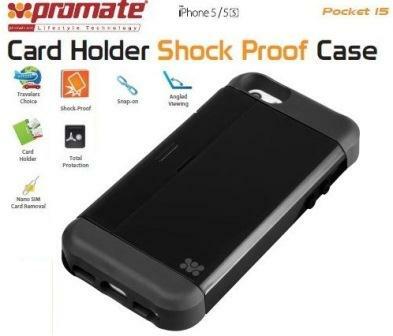 The Promate selfieCase-i5 Ultra-Slim Protective case with Built-in Wireless Camera Shutter is a robust case integrated with a wireless remote shutter. 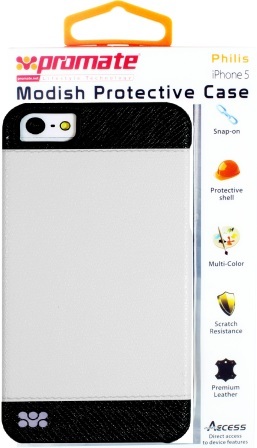 This robust case provides the highest level of security against drops and scuffs, while the remote camera shutter makes taking selfies a breeze. 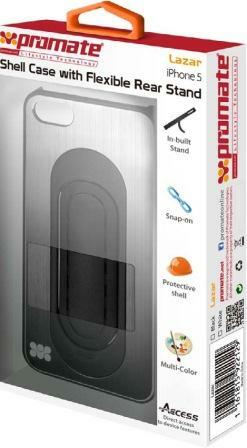 •Shutter control up to 10 Metres. The Promate Tacca is a unique and creative custom made flip cover case for the IPhone 5 to protect your iPhone 5 from everyday knocks and scratches This Luxurious Genuine Leather Flip Cover comes complete with secure snap shell holder from the inside and a versatile front cover that opens to reveal easy access, to all the iPhone 5 functions and ports, it also comes with a leather strap to enhance the portability of the iPhone 5. 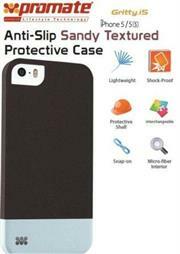 Its both slim and stylish and will protect your phone from any external impact. 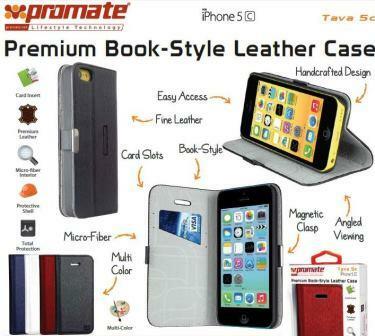 The Promate Tava 5c is a uniquely designed premium book-style leather flip case for iPhone 5c. It provides total front and back protection with improved functionality with a horizontal standing option. With the smartphone fitting snugly on its inner shell for added protection simultaneously lets you access all external features while the smartphone. The additional card pockets on the inner side of the micro-fibre flip cover keeps your cards in place. 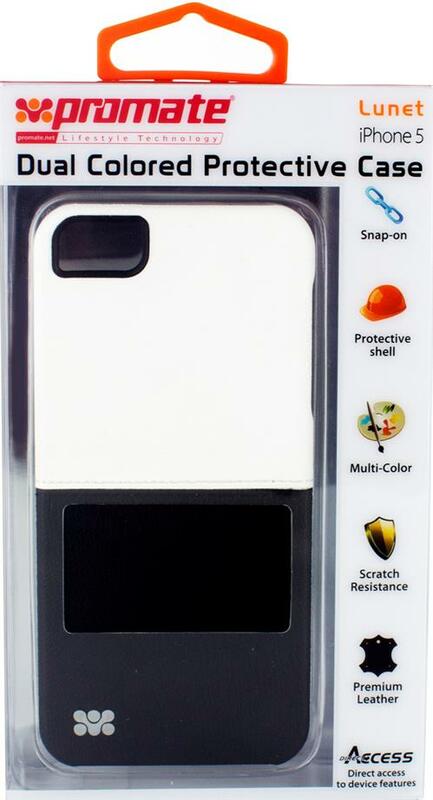 A magnetic leather fastening shuts Tava 5c when the iPhone 5c whilst not in use and provides overall protection for a long term operation and usage. 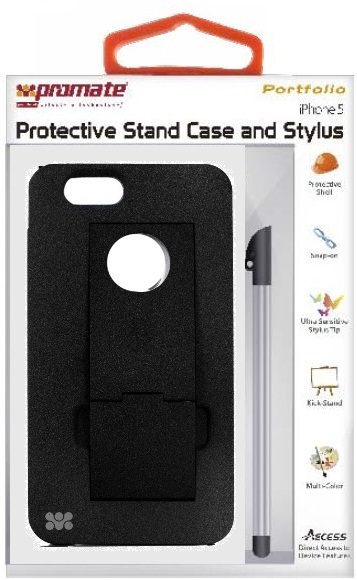 The Promate Portfolio Protective Stand Case and Stylus is a case made to make the most of the iPhone 5, Portfolio isn’t just protecting your smartphone, but gives more functionality to utilize its touch features. With a unique sandy finish texture, this protective case also has a kick-stand which allows portrait or landscape viewing on your iPhone 5. With in-built stylus, you are free to explore the touch functionality of your iPhone 5 even more conveniently. When not in use, simply slide the stylus inside the case’s side slot. 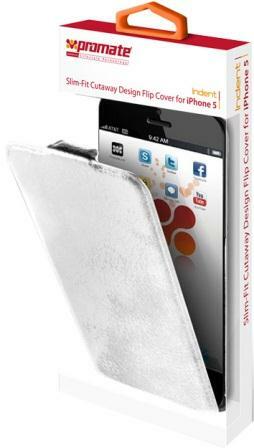 Portfolio is purely the most complete protective case which not only defends the iPhone 5 but increases the usage on your touch screen device. 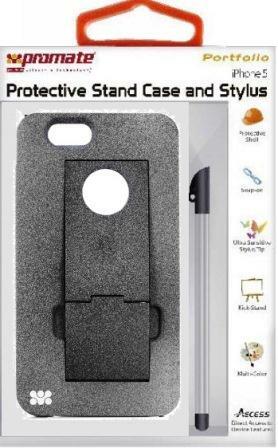 The Promate Portfolio Protective Stand Case and Stylus is a case made to make the most of the iPhone 5, Portfolio isn’t just protecting your smartphone, but gives more functionality to utilize its touch features. With a unique sandy finish texture, this protective case also has a kick-stand which allows portrait or landscape viewing on your iPhone 5. With in-built stylus, you are free to explore the touch functionality of your iPhone 5 even more conveniently. When not in use, simply slide the stylus inside the case’s side slot. 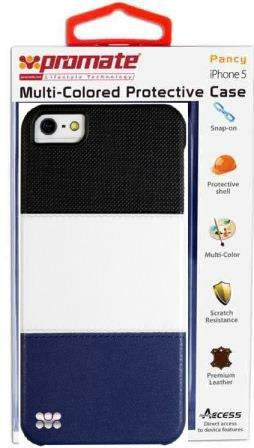 Portfolio is purely the most complete protective case which not only defends the iPhone 5 but increases the usage on your touch screen device. 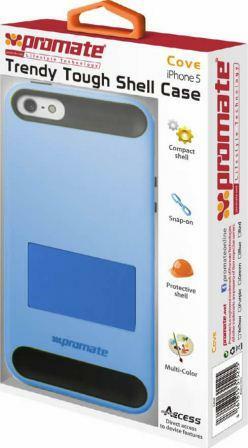 The Promate Lunet Dual Colored Protective Case for Iphone 5 is a complete durable case with a cut-out design, allowing iPhone 5 users full access to all the functions and ports of the phone. 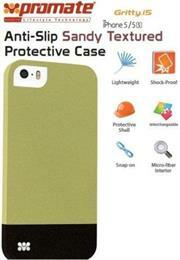 The smart combination of polycarbonate for durability, leather for style, provides the trustworthy protection for your iPhone 5. Lunet assures all that you are looking for: scratch resistance surface combined with multi-colored premium leather providing modern look for your dynamic lifestyle. The Promate Pancy Multi-Colored Protective Case for Iphone 5 is Innovative in its design, that delivers the extraordinary combination of usability and portability that you are looking for your iPhone 5 protection. 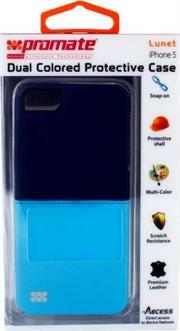 The case is a hybrid between polycarbonate shell and premium leather, coming in vivid colors, perfect for users who desire durable protection with a clean, modern design. 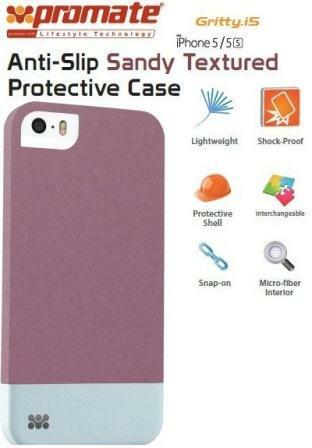 Its shock absorbent surface doesn't dent nor will tear or scratch. Just place the smartphone into Pancy and it will remain fully functional while in the case with access to all the iPhone 5 futures, meanwhile delivering the trendy design even for the most refined users. The Promate Pancy Multi-Colored Protective Case for Iphone 5 is Innovative in its design, that delivers the extraordinary combination of usability and portability that you are looking for your iPhone 5 protection. The case is a hybrid between polycarbonate shell and premium leather, coming in vivid colours, perfect for users who desire durable protection with a clean, modern design. 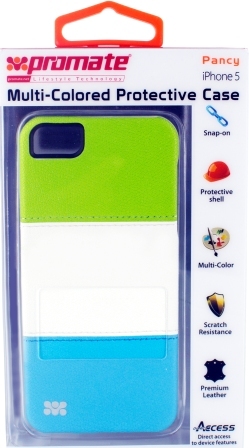 Its shock absorbent surface doesn't dent nor will tear or scratch. 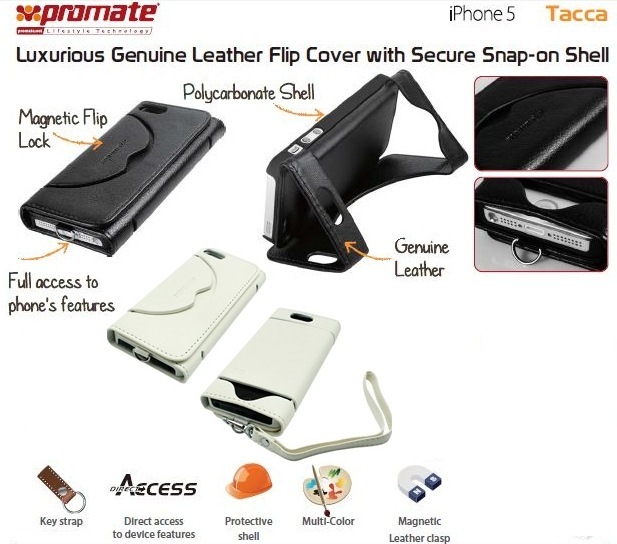 Just place the smartphone into Pancy and it will remain fully functional while in the case with access to all the iPhone 5 futures, meanwhile delivering the trendy design even for the most refined users. The newly developed Promate Philis protective case delivers supreme protection for your iPhone 5 daily usage. Its interior is providing the best of both worlds: a combination of sophisticated design for effectiveness, beauty, and complete protection, while still providing full access to smartphone ports. 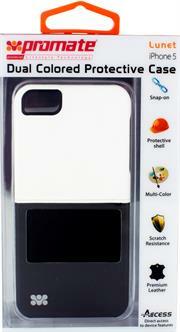 Philis takes care of your iPhone 5 interior and exterior look, assuring reliable and scratch resistance shield. 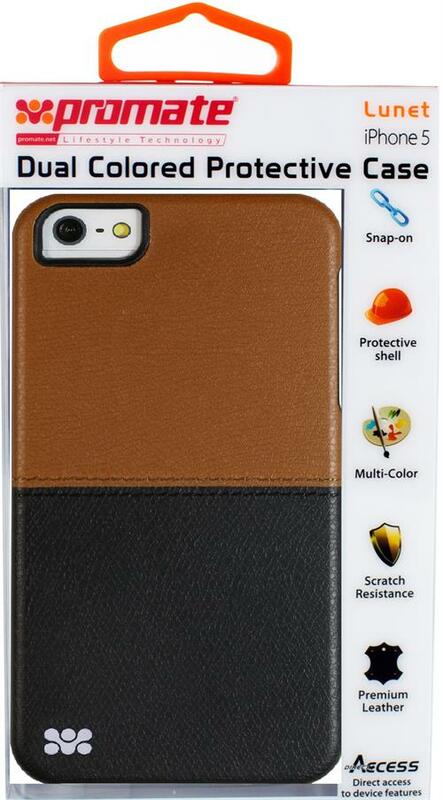 The Promate Rocha Slim-line pouch leather protective case for iPhone 5 / 5s is a slim, stylish and protective leather case for iPhone 5 / 5s. A sleek pouch style design enables the iPhone 5 / 5s to slot-in and out of the case with ease. The magnetic clasp provides ultimate secure fit. Rocha is simply the on-the-go case for every iPhone 5 / 5s user, delivering complete protection without the fuss. ffs and scratches, yet still provides complete access to your phone’s main functions. Lightweight and portable, the Lazar is a complete solution for your iPhone 5 case which won’t settle on the ordinary. 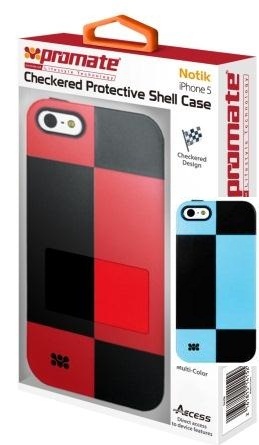 The Promate Gritty.i5 for iPhone 5/5s is made of a high-quality anti-slip texturized polycarbonate plastic that provides long-lasting protection from accidental drops, scratches, abrasions and damage. The micro-fibre interior provides soft, impact-absorbing protection, keeping your phone free from scratches and bumps. 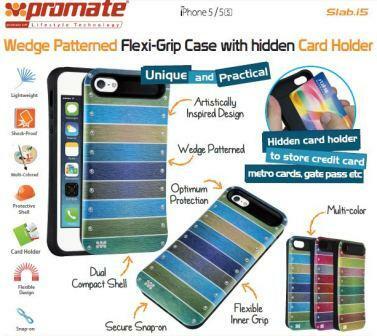 Promate Slab.i5- Wedge Patterned Flexi-Grip Case with hidden card holder-Show off your signature style with Slab.i5, a sleek case for your iPhone 5/5S. 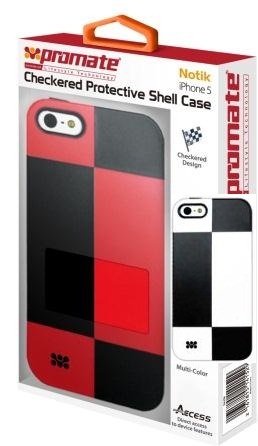 Combining luxury with ultimate protection, this fitted flexi-grip snap on case is covered with an easy-to-grip back surface that is richly printed with a modern abstract design. 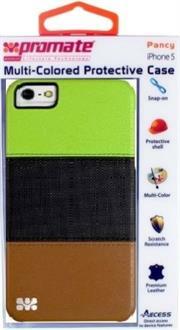 It also features a hidden card holder that may be used to store your credit cards, metro cards, etc. 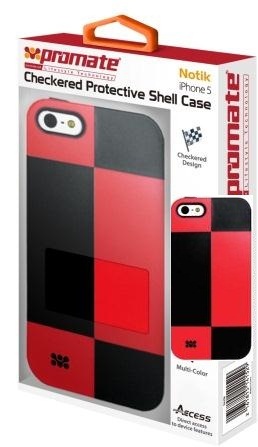 Pleasing to touch, this lightweight and durable custom case allows optimal access to all sensors, ports, and controls on your iPhone 5/5s, while offering superior comfort. •Provides optimum protection from accidental drops. There’s no better way to stay organized, but with Pocket.i5, a shock proof rubberized case with an in built card holder for iPhone 5/5s. You can now keep your important business cards and other payment cards close to your iPhone 5/5s. You could even use it as a kick stand which allows landscape viewing of your iPhone 5/5s with ease. Now never lose your Sim-card remover with a specialized cut-out to store your Sim-card remover and an additional Sim-card. Pocket.i5 is a hard rubberized shock proof cover that will protect your precious iPhone 5/5s from bumps and bruises. • Specialized cut-out to store Sim-card remover and an additional Sim-card. • Form fitted and fits snugly on the iPhone 5 and iPhone 5s. • Full access to phone’s features through precision cut-outs. 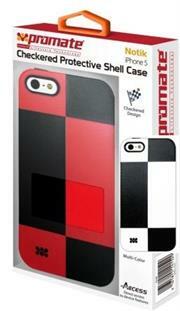 • Made from the finest quality rubber coated plastic material.